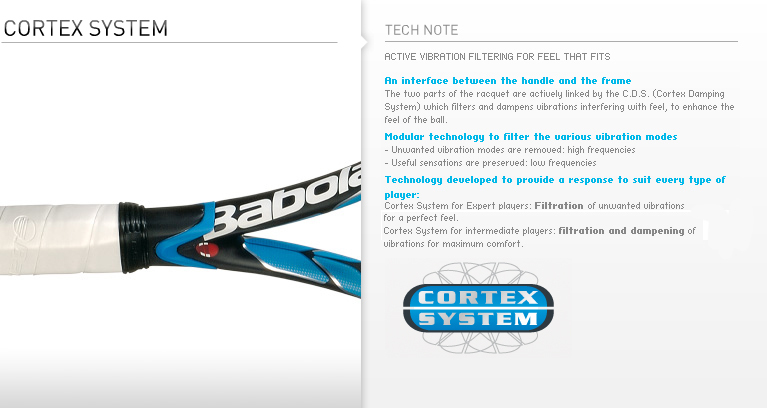 Babolat's innovative Cortex System is revolutionary in its ability to filter different vibrations. Cortex Racquets filter vibrations for a purer feel of the ball, meaning this system of racquets is best for competitive and advanced-level players. By maximizing comfort, this new system has revolutionized the tennis world. The Cortex system is now available in two versions, the Pure Drive Series, which reduces vibrations without risking feel, and other Babolat racquets, which filter and dampen for maximum control and stability. Thanks to this new technology, the interface between the handle and the frame is excellent for reducing vibrations which could cause severe damage to the arm and wrist. The C.D.S (Cortex Dampening System) actively links the two components of the racquet, which truncates and dampens the vibrations interfering with feel; in turn, enhancing the feel of the ball. The C.D.S also filters the different vibratory modes which eliminates unnecessary vibrations and enhances the feel of the ball.